You take no battle damage from your opponent’s monsters this turn. Your monsters cannot be destroyed by battle this turn. Looking again at Waboku, a card that’s existed since the original starter decks, and remains an awesome Trap Card. Simple, cost-free, Normal Trap Card to use. Activate it whenever and your monsters can’t die from battle and you don’t take battle damage that turn. Use it on your turn offensively, crashing a monster of equal ATK into another, or use it on your turn to protect your monsters from battle destruction or against a direct attack. 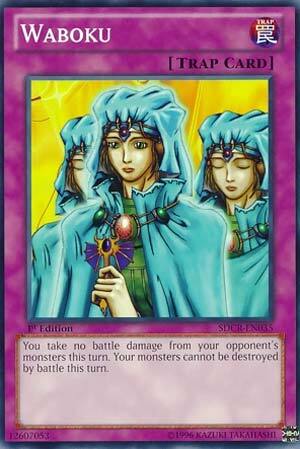 It remains an awesome Trap Card to use in any deck that deems it worthy of a slot. Crunch$G We did this a little while back, but we decided to revisit it for Yugi week. Waboku. Waboku prevents your monsters from being destroyed by battle and you take no damage this turn. The card sees major play in stall decks that have an alternate win condition, which aren’t too competitive, but otherwise it isn’t necessary for other decks. The card is meh. Sorry this review is super short, but I said everything about this card a few weeks ago that I felt I needed to say and this is just a short summary of what it does. Alex Searcy Moving to the non-Spellcaster part of our week, we come to Waboku. I think we only saw this used in the original anime once. Used in a rare duel appearance by Tea, in her brief duel against Mai, after Yugi loses to Kaiba in Duelist Kingdom. Waboku is very old, but still good, just perhaps not as relevant as it use to be. Many other Traps, and even Monsters, can do similar to what Waboku does (or slightly different, or better) but that doesn’t make Waboku bad. Protection is good. Not taking Damage is good, as is not having your Monsters be destroyed. In my opinion, it’s all about personal preference. If you like this card, and/or it works for you, then by all means, use it. At the very least it can be a nice Side option, and can be a useful tool in thwarting OTK/FTK too.